Former TVB actress, Sherming Yiu (姚樂怡), and Alan Wu (吳俊匡) held their wedding celebration on April 26, 2012. The lively 30-table banquet took place at the Ritz Carlton Hotel in Hong Kong. The bride wore $5 million HKD in sparkling jewelry, including a 1.5 carat diamond ring. The groom was a good sport, enduring the torturous games devised by the bridesmaids, proving that Sherming was not an easy woman to win her hand in marriage! Best known for her role in TVB drama, Armed Reaction < 陀槍師姐>, Sherming has since retired from acting and currently worked in the wedding planning sector. Raised in the Netherlands, Alan worked outside the entertainment industry as well. The couple has been dating for 8 years. The bridesmaids consisted of Angela Tong (湯盈盈), Toby Leung (梁靖琪), Janet Chow (周家蔚), Margaret Chung (鍾麗淇), Charmaine Sheh (佘詩曼), Pinky Cheung (張文慈), and Emily Kwan (關寶慧). Sherming and the bridesmaids traveled to Taiwan earlier for a girls’ getaway trip prior to the wedding. During the morning bridal games, Angela led the bridesmaids in torturing the groom mercilessly. When it was discovered that Alan’s legs were quite hairless, he was forced to take off his shirt. Angela mercilessly stuck a hair removal pad on Alan’s armpit, saying mischievously, “I know Sherming is afraid of underarm hair, so I am cleaning him up for tonight!” Alan’s groomsmen were forced to remove the hair on their chest! Toby Leung revealed that the bride actually came up with the idea for the game! The groom was also asked to “French kiss” a photo of Eric Tsang (曾志偉), in which Alan had to place his tongue on Eric’s tongue! Regarding Sherming as one of his daughters, Eric was especially jovial last night. 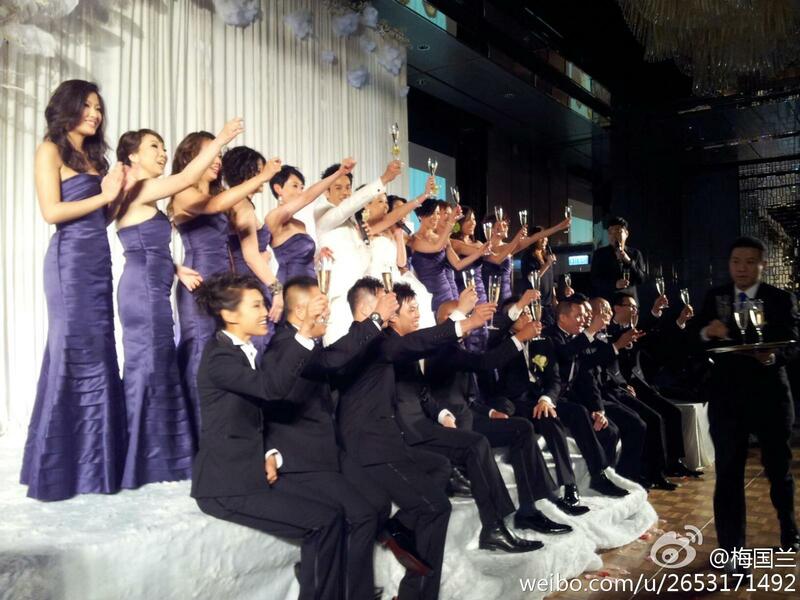 He vowed that he will not leave the wedding banquet without getting drunk! Since Chin Ka Lok (錢嘉樂) was working and unable to attend the wedding, Angela Tong was let “loose” and played uninhibitedly. Angela was unafraid that revenge will be enacted at her own future wedding. Asked whether she was afraid that Alan will be further tortured at the wedding banquet, Sherming said that the tactic would be to get Angela drunk as soon as possible! 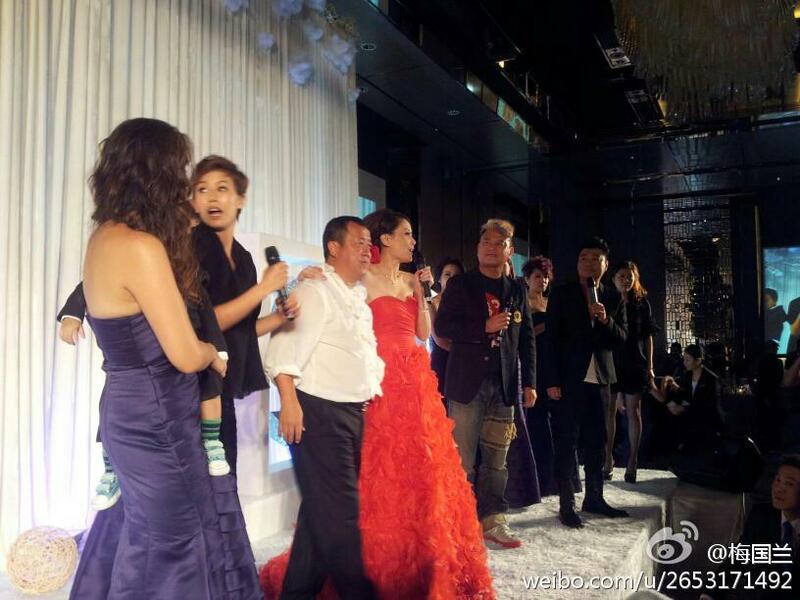 Celebrity guests that attended the wedding wedding included Alex Fong (方中信), Annie Man (文頌嫻), Timmy Hung (洪天明), Cutie Mui (梅小惠), and Evergreen Mak (麥長青). The couple will hold an additional 100-table wedding banquet on April 29th in the Walled Village of Hong Kong, which was Alan’s family’s hometown. Afterward, the couple will fly to Las Vegas, USA to obtain their marriage certificate and enjoy their honeymoon there. Jayne: Sounds like a fun wedding! It must have been hilarious (although a bit messy) for the bridesmaids to give the groom a hair removal treatment! Yea they’re very close. You can tell when you watch Eric Tsang’s game show. He always invites her to the show. I see her more in variety shows than TVB series. During speech, Eric Tsang and Nat Chan went onstage as elders, Eric even teared up. Louis Yuen is the mc. Congrats! I noticed that it’s always the same girls in the bridal party-Janet chow, Toby Leung, Angela Tong, etc. They must be a big, close group of friends and just happened to be getting married one after another! I guess Janet made a lot of new friends in HK after dating Timmy! Haha, yeah, I noticed that too. Me too! How come?..especially Janet….? Yeh its that same group of friends. Lots of wedding from that group in the past year or so. Angela Tong’s wedding is next, you’ll see the same ppl again lol. just keep recycling the bridesmaids! In a recent interview, Charmaine Sheh mentioned that she is good friends with Timmy Hung.I was surprised that she did not attend the wedding nor was a bridesmaid as the same group of girls were bridemaids in the last few weddings. She has a public event in Mainland China that she has committed to, whereas for Annie and Sherming wedding she can apply leave from filming crew. If you follow Janet & Charmaine weibo, they agreed to have a meal later to make up for it. maybe janet chow isn’t as close to charmaine as the other girls are? so charmaine can’t be bothered to take leave? How can you take leave when it’s an one day event, booked by organizers, with ads publicizing your appearance? Mind you, these kind of schedules are not made last minute, but several months ahead, some even a year. It’s different from taking leave from filming because directors can reschedule your filming time slot. Anyway, since you dislike Charmaine so much, the above doesn’t matter to you anyway. So yeah, whatever you think it is. The bridesmaids Chinese dress is horrible, gives them no figures unless Janet Chow is already up the duff and is looking a little chubby.